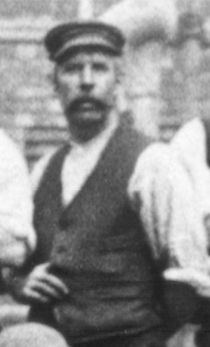 Stanley Curson ( believed to be pictured above ) was the 8th of 10 surviving children born to John and Sarah Ann Curson (née Wilkerson) both of Great Ryburgh. They were married in 1887 although not in the Parish Church of St Andrew. 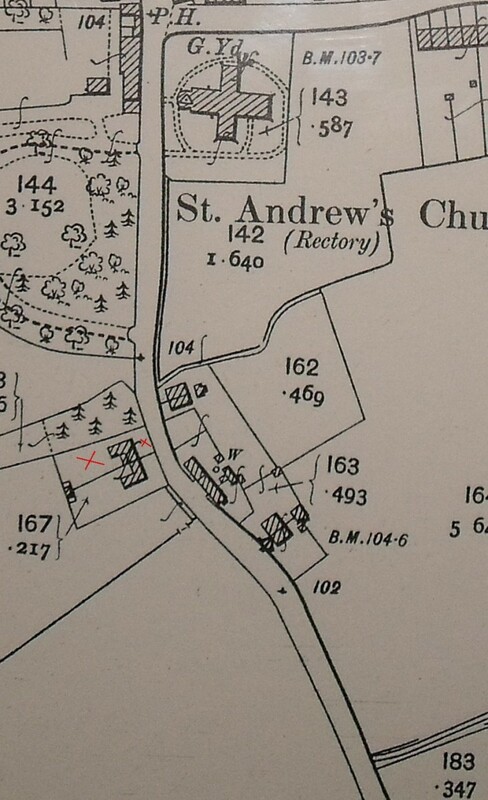 They lived in Mill Road according to the Census returns for 1901 and 1911 and probably in the cottage nearest the Rectory on the map below. and “Near the School” probably after John’s death when they no longer had a tie to the Maltings’ owned properties in Mill Rd. Stanley was born on November 15th 1897. He attended the village school from the day after his 5th birthday in 1902 where he is listed No 60 in what was then the new register (and the earliest of those to survive). Headmaster, Albert Foster subsequently pencilled “Dead” in the Register margin beside No 60 and also in the case of just four other pupils. Stanley left school on 30th June 1911, when the Register says he went straight into “employment”. According to his surviving but very fragmentary service record, he is described as a labourer. His father John had been a stationary engine driver at the Farmers Foundry before going on to work first as a labourer and then again as a stationary engine driver at F & G Smith’s Maltings. John died in 1912 in hospital in Croydon and was buried at St Andrew’s on 18thJune that year. As found on his Attestation form, ”the said Recruit has made and signed the declaration and taken the oath before me at Norwich on this 27th day of November 1915”. He was appointed to the Norfolk Regiment on 25th Jan 1916 and became No 241173 Private Stanley Curson 1/5th. Btn. Norfolk Regt. 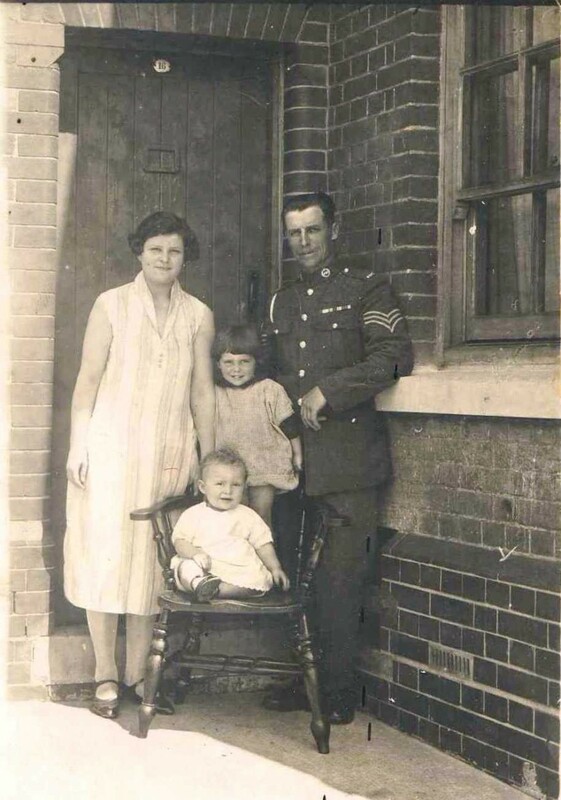 His Home training lasted 164 days until 7th July 1916 after which he joined the M.E.F. until his death in Palestine on 19th April 1917. His military career lasted exactly 1 year and 86 days. We have received too the sad news that Stanley Curson is missing, but trust yet we may hear of his being found as W. Wilkin, in a Red Cross Hospital. The internet shows three singed pages from the “burnt records” all that has survived of his service record and it is these that have provided the sketchy details above along with the stark facts of his death and place of burial. Stanley’s name appears on all the Memorial sites in the village and is found with his two brothers and a cousin on the Roll of Honour. Great Ryburgh Village Hall Memorial Panel. Arthur James Pennell married Ethel May in Paddington on April 5th 1913. Herbert Stein Chandler (see below) was one of the witnesses to sign the register. He was discharged in July 1920 as no longer physically fit for war service and with a small disability pension which expired in January 1921. Their daughter Ruby Adelaide born April 1913 has this recollection of the day the family heard that Stanley had been killed. At the time Ruby had been staying with her Grandmother in Ryburgh and came home from school and could not find her grandmother. She went into each room calling her and then down to the outside toilet where her grandmother, having received the telegram, was sitting crying. She said to Ruby ' you go inside my woman, I will be there in a minute'. 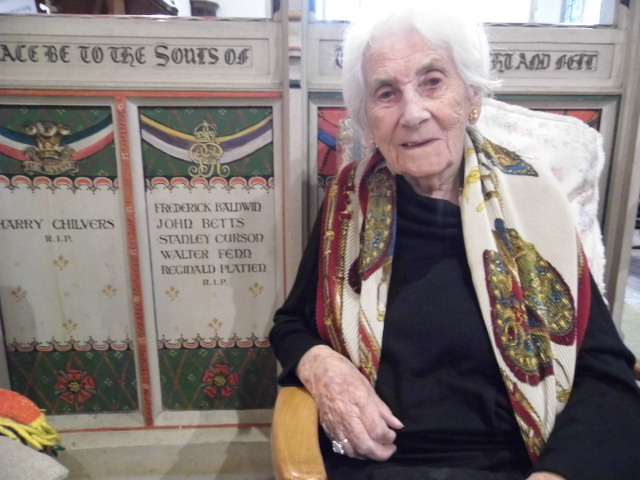 Both Grace Pera and her younger sister Audley Stassie were baptized together as part of a noticeable backlog of baptisms postponed during the years of the deeply unpopular Rector, Revd. Morris Fuller and carried out on the arrival of Revd. Henry Fowler-Baker. Herbert Stein Chandler and Audley married at St Andrew’s Gt. Ryburgh on 10th September 1913. Herbert is listed as a mechanic and his father David an “ex policeman” in the register. The 1911 Census confirms that he was an Engine fitter (motor omnibus company). General Curson (b. July 1891) in Great Ryburgh married Nona Winifred James (b.13th Dec 1902). This photo is of Sgt. General Curson serving in India with his wife Nona. Married 26th October 1922 in Bangalore, Madras with their daughter and son in 1923. They returned to Liverpool where they had two more children. Our sympathy goes out to the anxious relatives of William Doy and General Curson, both of whom are reported "missing"
I think we were all, I am sure, delighted to see and welcome A. Comer, G. Howe, General Curson and Ernest Abbs safely return home after their terrible experiences as Prisoners of War. Thank God they are home and considering all, fairly well. We look forward to welcoming the others shortly. He died on August 10th. 1963 in Liverpool. Rossie Alexandra Curson married Percy Samuel Skeates (b.Oct 1893 in Paddington). Birth Jan 1893 in Great Ryburgh. Death 11 Mar 1923 in Palmerston North, Manawatu-Wanganui, New Zealand. Napoleon Curson b. Sept 1894 in Great Ryburgh married Dorothy L. Gooch (b.7th July 1899 Ditchingham) in 1922. Doris Josephine Curson b.Apr 1896 in Great Ryburgh married Frank Brogan (b. 1895 Canada). Stanley Curson b. October 1897 d.19th. April 1917 See above. Eve Adelaide Curson b. Jul 1899 in Great Ryburgh married William John Freshwater (b.10 Nov 1895 Walworth, London). The latest developments and some detective work. 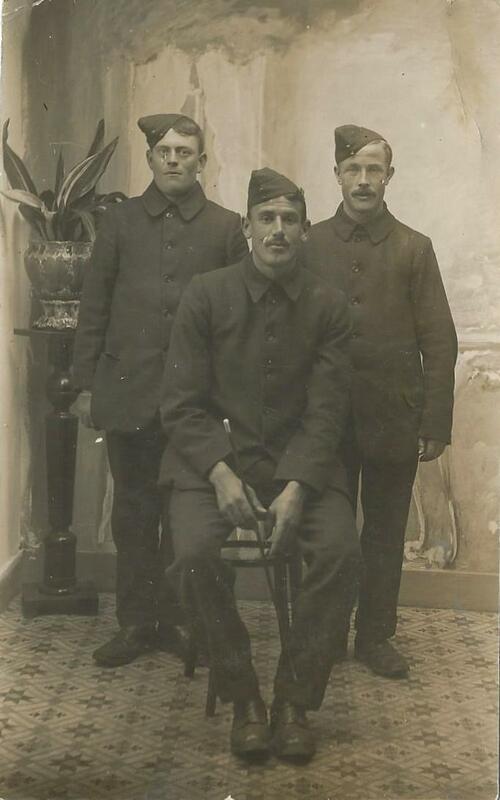 The other photo is of three new recruits, wearing what is thought to be the temporary uniform issued to “Kitchener’s Army” recruits due to a shortage of the real thing! This photo also gives no names and dates. Questions to consider are: Whether there is any similarity between any of the subjects on Ruby's photos? Are there any other facts about the circumstances of known Ryburgh soldiers? Circumstantially Stanley could well be the young man in the studio portrait. The Cap Badge is certainly Norfolk Regiment. The military service of William Freshwater or Herbert Chandler two further Brothers-in-law have yet to be investigated but it is unlikely that either of them would have been with the Norfolk Regiment. The condition of the photo is excellent and has been kept safe for an important reason. The battered photo of his brothers and mother shows a different sort of keepsake. 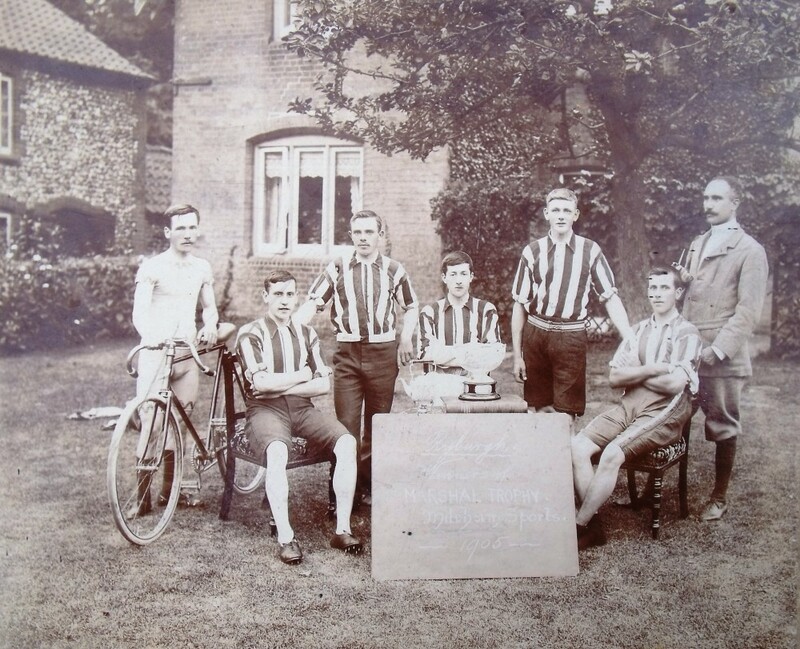 A further photograph from 1905 depicts another of Ryburgh’s war dead, Charles Thomas Steward……..although he is named as being on the photo, he isn’t identified individually. Visually he is a possible candidate for the man with the moustache on the back row. 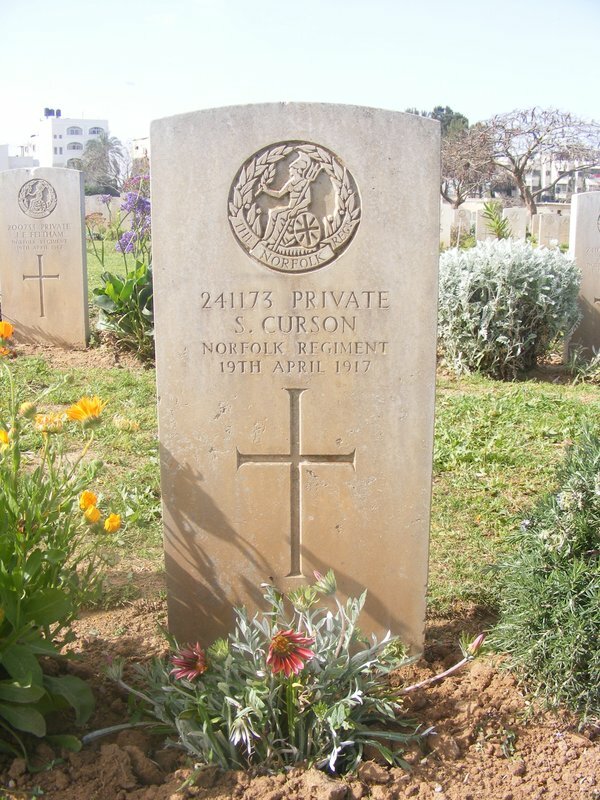 The man is older and Charles Steward would have been 31/ 32 when he joined the Norfolk Regiment in Norwich just 7 days after Stanley. Like Stanley, Charles went to the Middle East and died 5 months after Stanley in September 1917. The photo below shows a comparison to test the hypothesis that Stanley is the young man depicted in both the photos and that another could be Charles Thomas Steward? That the 3 are all Ryburgh men who joined up, on or around the same day in November 1915? There is as yet no evidence for the identity of the 3rd man in the foreground. That these 3 pals are pictured trying to look soldierly in their ill fitting blue sack uniforms when first issued? 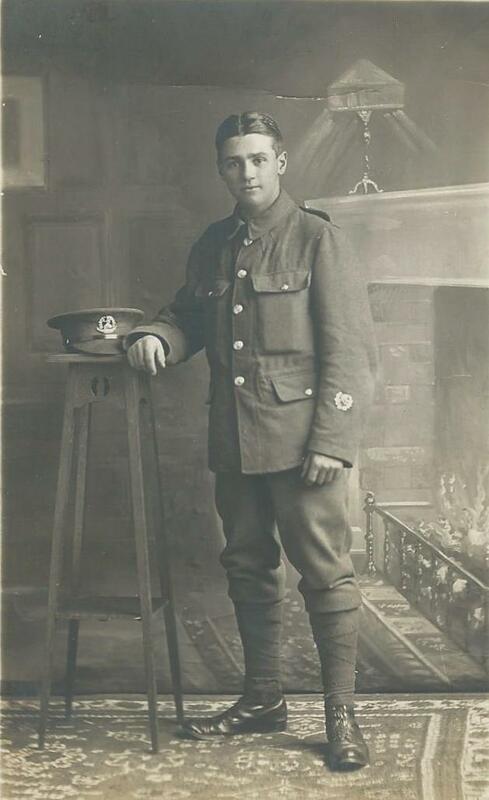 That a picture of Stanley sent to his mother was taken after a few weeks of training with some of his real basic uniform and perhaps looking not quite so confident after his recent experiences of army life and which has been kept anonymously in a box of family photos with a direct link to Stanley’s mother? Can you add any further evidence either way? On the day of the commemorative peal Dawn and Richard Goodings came to St Andrew's and with them they brought a small peice of family history to add to the Ryburgh Archive. 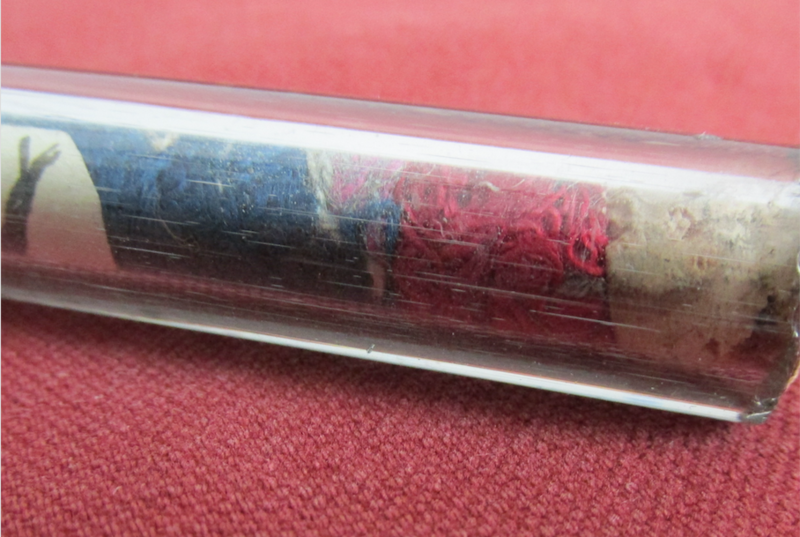 It consists of a narrow glass cylinder 15mms diameter, 3mm thick and 240mm long, containing John Curson's name and date of birth in ink on what looks like parchment dcorated with coloured silks. The ends are sealed with cork although one end has been opened at some point and resealed. There is a very great temptation to open it again to see if it contains anything more but this has been resisted! Have a good look at the photos below and if anyone can shed any further light on the nature of this curious artefact we'd be very pleased to know of it.